Soliciting Bids for Architectural Services? 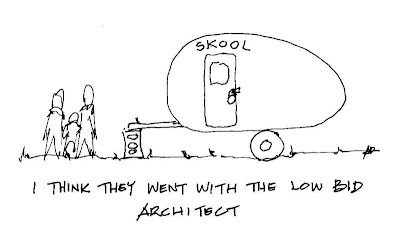 Soliciting bids for architectural services carries a lot of risk. The main risk is that the party soliciting the bids may not understand the services and may not establish the scope of work sufficiently to be able to realize desirable results from all the architects who may decide to submit bids. If lowest price governs the selection, then the result may be reduced services – less than what is needed for your project. As the client, you may not have the input that you need to have in the design process. During construction, you may not have the attention (construction administration services) that you need from the architect to reasonably determine a contractor’s progress and compliance with construction document requirements. In the end, you may not have a completed project that meets your needs. Consider the school above that resulted from soliciting bids for architectural services. A qualification-based selection process is likely to produce better services, a better experience for the client, and better results.